The economic expansion continues across nearly all states. In April, 47 states saw job gains over the year and 48 states’ coincident indexes rose as well. About half of states have seen the pace of job gains accelerate at least a little relative to a year ago. Nevada, Arkansas and Oregon have seen the largest acceleration in the country over the past year, as measured by job growth. In terms of the strongest acceleration in recent years, only Nevada, Oregon, Florida and Delaware have seen growth improve by 1.5 percentage points or more since 2011 and 2012. The first three states were hit hard by the housing downturn and as the housing recovery took hold – at least prior to stalling out – it is no surprise to see these states among the Top 10 again. However, while nearly the whole country is expanding, the strength of recovery is certainly not even, and most states’ rate of growth remains subpar. 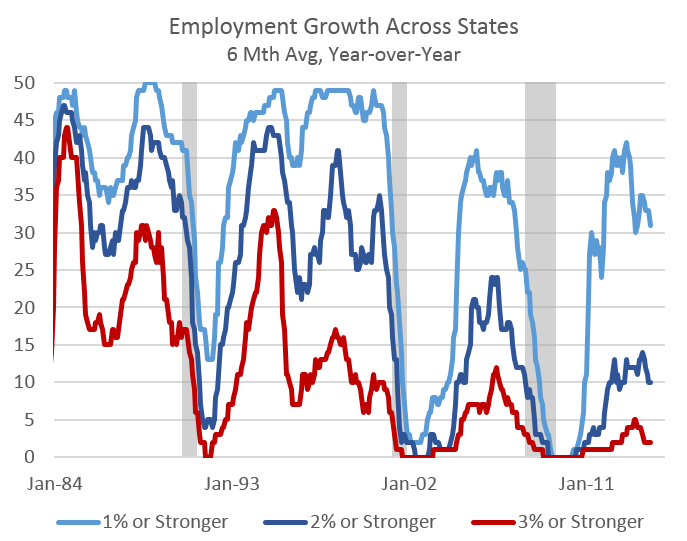 So far in expansion the number of states at any given time that is experiencing job growth greater than 1% over the year is effectively on par with the share seen during the housing boom (Oregon counties show a similar pattern), but lower than during the expansions in the 1980s and 1990s. What makes the aftermath of the Great Recession even weaker are the number of states seeing 2% or 3% job growth, which are half as many as during the housing boom and a quarter to a third the number from the 1990s. While the overall, national job growth rate is effectively matching the housing boom, the strength of growth is not as geographically diverse. Even so, while fundamental economic activity is continuing across states, one area where 2014 will certainly disappoint is personal income tax collections. Despite a very robust stock market in 2013 and strong home price appreciation, the outlook for taxable investment income remained subdued. Many Oregonians, and Americans across the country, cashed out capital gains in 2012 in anticipation of the federal tax increases, leaving fewer gains to be realized for tax purposes both in 2013 and going forward. As such, fiscal year 2013 saw an increase in growth across nearly all states and the expected hangover in fiscal year 2014 can be seen in the revenue forecasts as reported by the National Association of State Budget Officers’ fiscal survey of states. Note that the fiscal year 2014 figures are forecasts and not actual collections at this point. The April 2014 tax filing season was not a good one for states like Oregon that depend heavily on personal income tax revenues. Year-end tax payments fell sharply across the U.S., with the typical state seeing collections fall on the order of 25% during the peak processing season. Oregon’s personal income tax collections were not immune to this weakness. Sharp declines in late April and May have fully erased early gains posted during what began as a strong 2014 season for Oregon’s tax collections. 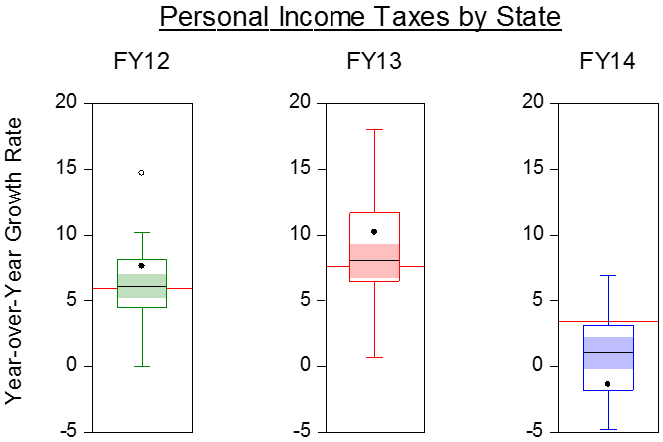 Much of the recent weakness in year-end personal income tax payments can be traced to investment earnings and other nonwage forms of taxable income … Although the response of taxpayers to rising federal tax rates turned out to be larger than expected, the decline in tax payments on the part of Oregon’s wealthy households was fully offset by smaller than expected refund payments returned to wage earning households. 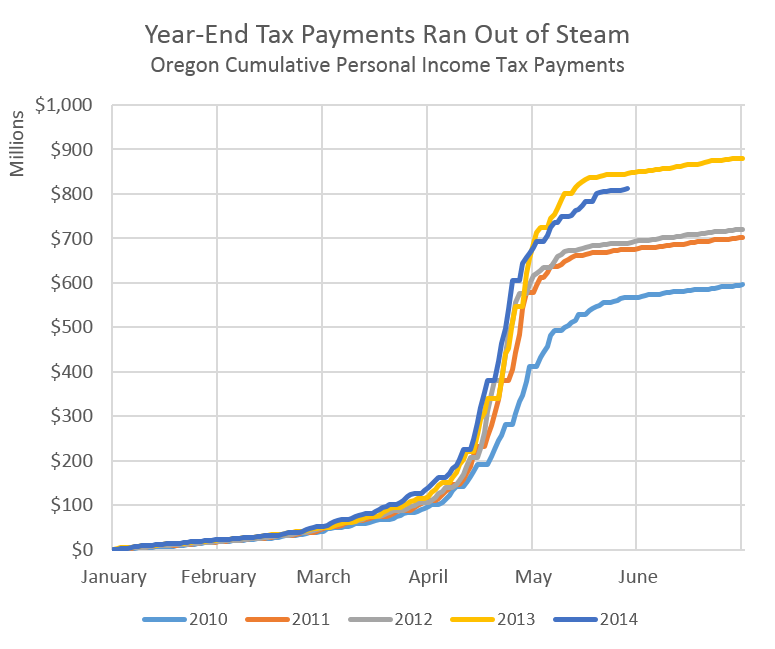 Overall, personal income tax collections in Oregon continue to closely match the forecast. Unlike the case in some other states that depend on personal income taxes, no large emergency budget adjustments are called for at this time. This post has been adopted from our office’s latest quarterly economic and revenue forecast. Posted in Employment, Revenue, State Comparisons | Tags: 2014, Employment, Employment Growth, expansion comparison, fiscal year 2014, Forecast, forecast comparison, forecast tracking, fy 2014, Growth, income tax collections, income tax growth, income taxes, job, job growth, nasbo, Oregon, personal income tax, personal income tax collections, PIT, State Comparison, state comparisons, states, tax collections, tax revenue, U.S.